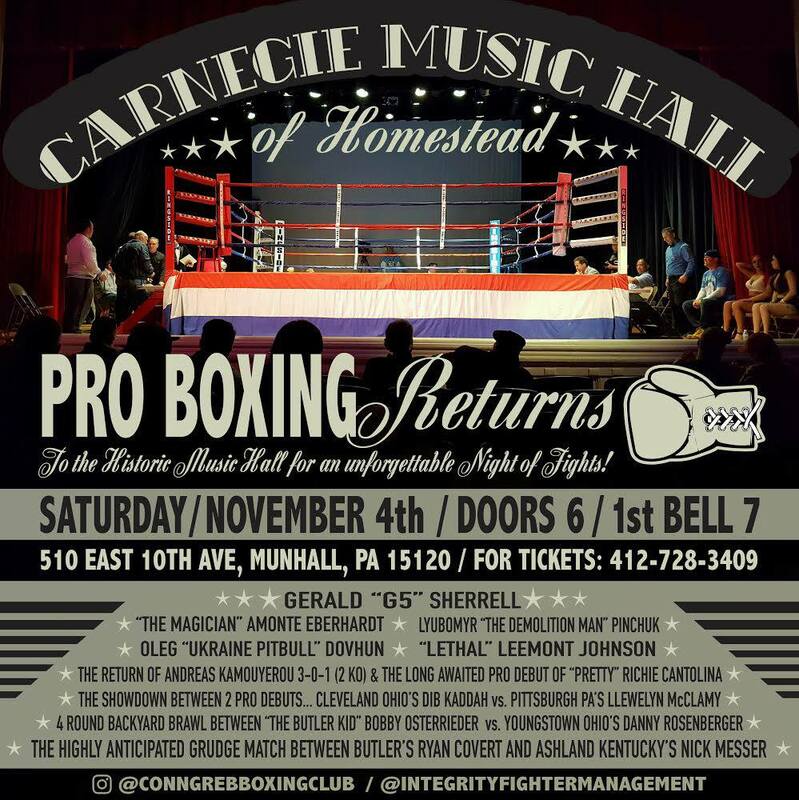 Pro boxing will make it's way to the Pittsburgh area next Saturday, November 4th when the historic Carnegie Music Hall of Homestead hosts a 9-bout card. 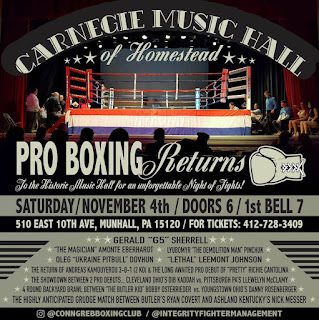 Headlining the card which is being promoted by Integrity Fighter Managment is undefeated Pittsburgh native Gerald "G5" Sherrell (7-0, 3 KO's). Another Pittsburgh prospect will be in action for the co-feature as Amonte Eberhardt takes on Ulises Jimenez of Mexico. Eberhardt. 26, is currently 9-0 while the 34-year-old Jimenez is 23-22-1 but currently on a two-match win streak. Youngstown native Danny Rosenberger will be in action in a 4-round bout at a 152-pound weight limit. Rosenberger, 27, sports a deceiving 1-3-2 record while fighting boxers with a combined 14-3 record while his opponent, Bobby Osterrieder will look to capitalize on his debut win. Osterrieder, 28, turned pro with a decision victory back in May in his hometown of Butler, Pennsylvania. We will have more on this card next week and will also be covering this event.